There are three very good reasons why nearly a quarter of the 65,000 square feet of metal wall panels on Facebook’s new data center in Prineville, OR, are perforated panels. Foremost, the screen metal walls secure the center’s sizable generator yard and help ventilate its diesel-fueled backup generators. The metal panels, including the perforated metal panels, also are customized by Metal Sales Manufacturing Corporation to allow the entire structure to meet strict LEED® Gold certification standards. More than half of each perforated panel—52.94%, to be exact—is open area for ventilation. Last is aesthetics. The metal panels perfectly complement the simple and minimalist design of the neutral-colored center. 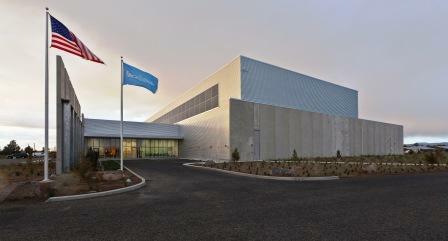 But don’t let the Facebook data center’s understated façade fool you; inside the center is a powerhouse. The energy-efficient structure houses tens of thousands of Facebook’s servers containing information for its 800 million users. The only hint that the building serves one of the busiest websites in the world is the blue flag with the iconic ‘Facebook’ logo. 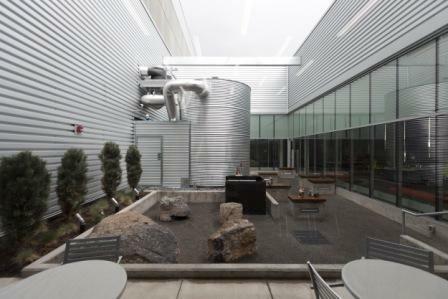 Want to learn more about the role metal has played in Facebook’s new data center? Metal Sales has the full story.